Nikki Haley, governor of a state in US, arrived in holy city Friday evening. She was an Indian- American. Haley’s father’s family have lived in Amritsar’s Verka suburb. they lived there until the early 60s before migrating to the US. They have not visited her family’s home state in nearly four decades. She is born in 1972, Nikki Haley last came to Amritsar, 250 km from Chandigarh, when she was two year old kid. 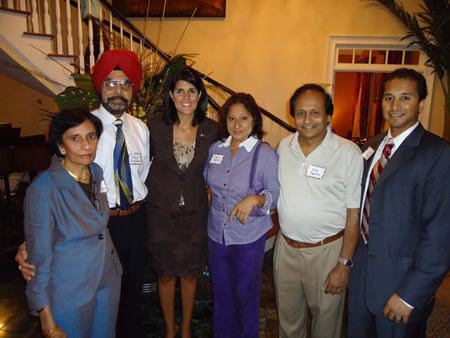 Nikki Haley’s name was Nimrata Randhawa before her marriage. Her relatives celebrated in Verka suburb when she became the South Carolina state governor in United States of America for the first time in November 2010. She was re-elected as governor of South Carolina recently. Nikki Haley this US South Carolina state governor is on a 10-day trip to India during which she will visit Delhi, Mumbai, Chandigarh and Amritsar to seek investment in her state Carolina. In Amritsar, she will visit the Darbar Sahib(Golden Temple) and Jallianwala Bagh ground on Saturday. And from there she will call on her relatives also.